This release is for all of you who like the warped world of Traum! Olaf Stuut is a versatile person playing multiple instruments and who draws inspiration from a wide spectrum of genres like jazz, funk and rock music. He has remixed Minilogue’s "Let Life Dance Thru You“ for us already and has released some fine music meanwhile, so it was time for us to sign him for a Traum EP. Max Cooper is a strong supporter of his music and people in the scene respect him. On two of his trax Olaf collaborated with Dutch artist SQL with whom we have released severely EPs on Trapez ltd. He has contributed his knowledge of club scene from his perspective. "Spiropgraph" is a soulful piece of electronica that kicks off with a mighty rolling bass that can sweep you into another dimension. But that is only the beginning for something more great yet to come, when slowly sounds collide with vocals wrapped up in clouds of peacefulness. This piece of future funk electronica twists the multiple parameters to create a fantastic motion. "Spiropgraph" is soulful piece of fiction told in a style that is narrative but sticks to the cool parts! 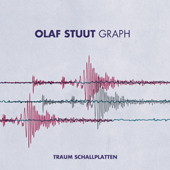 "Lithograph" produced by Olaf Stuut and SQL is more secluded but has those smaller peaks of vocal humming that build up a nice layer of comfort that puts a smile on your face. This is a track to sneak into and have the stress of your day taken into custody. "Shadowgraph" starts pulsating and then has the strange funk of Stuut take place with bent synth pads that unfold a spiritual deepness... it can glue worlds apart…together. Stuut is a master of bringing ends together that have never met before. This makes his music extremely vivid and fascinating. Try flowing his trail! "Heliograph" is the second track Olaf wrote with SQL on this EP and it starts as an airy and light track and then avalanches into weird monumental rock artifacts and returns to heaven like sounds. This voyage is for the headstrong and reflects on what we have been releasing alongside twisted electronica starting with our Ricardo Tobar releases. Berlin’s Aparde has remixed "Spirograph" and has removed all funky irritation to replace it with a soothing almost ambient feel that moves beat wise on a cats paw, cautiously but with continuity towards a place that we have never seen and which he will open up for a split second. The longer the track runs the more addictive it gets! This is slomo sexiness at its best. Petar Atmadzhov aka PHM has remixed "Spirograph" with a more linear dance-floor approach but still accounts for unorthodox programmings and midget breaks that give the track a nice direction. The track has an ambient break down in the middle which prepares us for the blast when the beat returns. A very good interpretation we think.